Aeromar does away with the peg board design, but keeps the hi-tech flexi-straw logo. 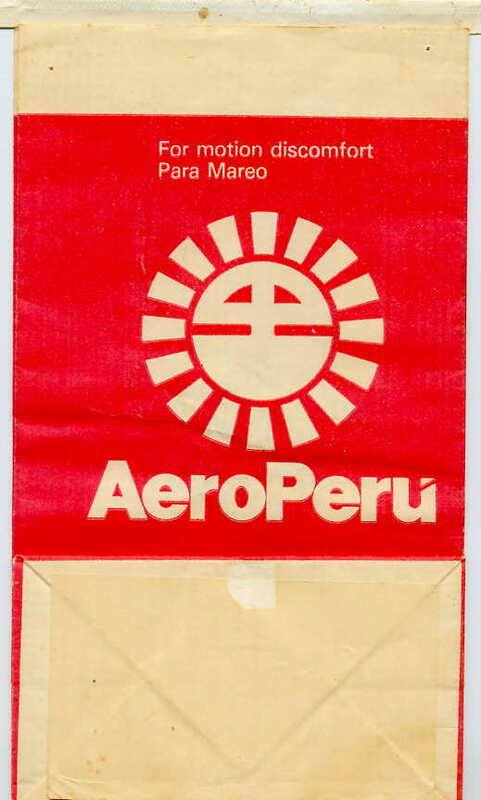 Plus, they've registered the Aeromar trademark. Exactly the same as the other Aeromar except with a block on the front. This bag was made in August 2015, as it says on the front. The logo has changed from Landscape to Portrait, otherwise it's a bit reminiscent of Aeromexico bags. 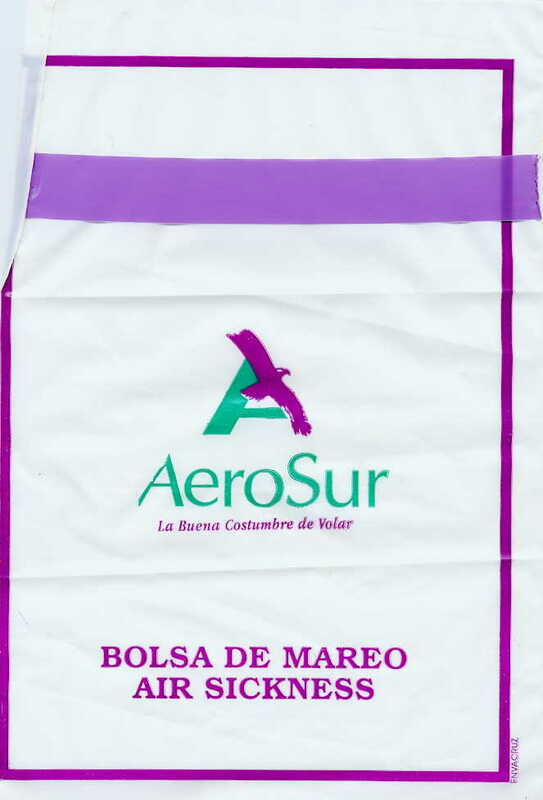 This bag is identical to the other Aeromar recyclable bag except on the bottom left there is no expiration date! Mayan Eagle Headdress displayed. A stoic character who probably doesn't throw up much. 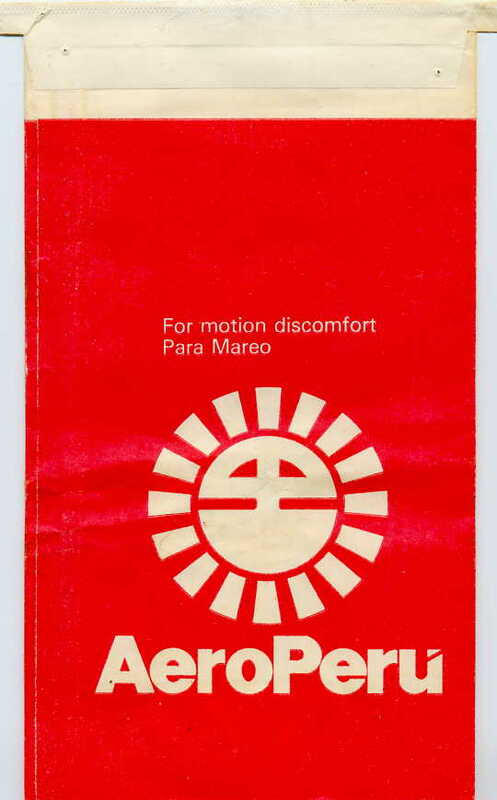 Identified by Ben Guttery as Aeromexico. He says, "UNKNOWN 9 is Aeromexico. It was also used by all their smaller airlines that they also own. That is their logo at the bottom -- the man's head. It is some kind of mythic creature. Check out their web site to see for yourself. 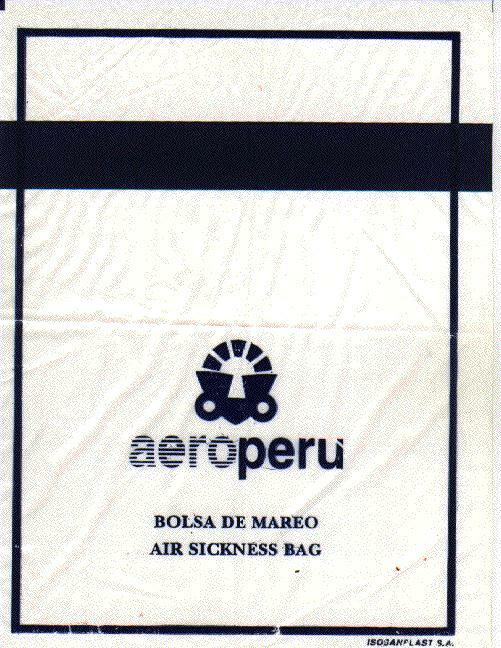 Much like college students wearing gym clothes that say 'Property of X University', Aeromexico has labelled its sickbags so that they say 'Property of Aeromexico'. Kind of an odd touch. The lines on this bag are spaced irregularly, giving the slight impression of depth (perspective would have worked better). Of all the orange AeroMexico bags made from paper, this one definitely has the smallest head. This bag sports the a smaller, scaled down head. Made from High Density Polyethelene. This is really quite a beautiful bag. The Halloween colors, the Mayan Font, the big AeroMexico eagle-head, plus the bag calls you amigo, as if everyone who throws up is a friend somehow. This bag is much like its predecessor, however they are now part of the SkyTeam and they don't care who knows it! Of all the orange AeroMexico bags made from paper, this one definitely has the smallest head. 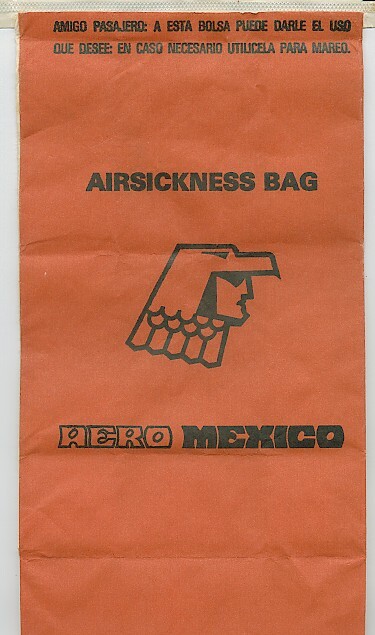 This bag is virtually identical to the other AeroMexico Orange Paper bag except on the back, the blow is low instead of high. Mayan Eagle Headdress displayed. A stoic character who probably doesn't throw up much. 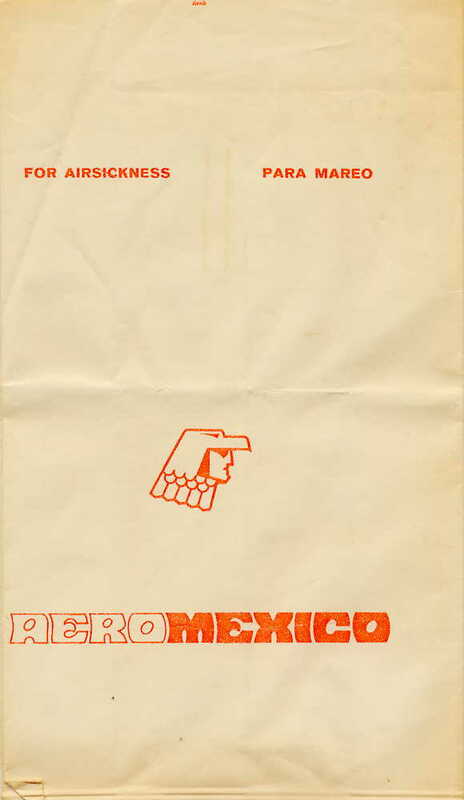 Identified by former collector Ben Guttery as Aeromexico. He says, "It was also used by all their smaller airlines that they also own. That is their logo at the bottom -- the man's head. It is some kind of mythic creature. Check out their web site to see for yourself. 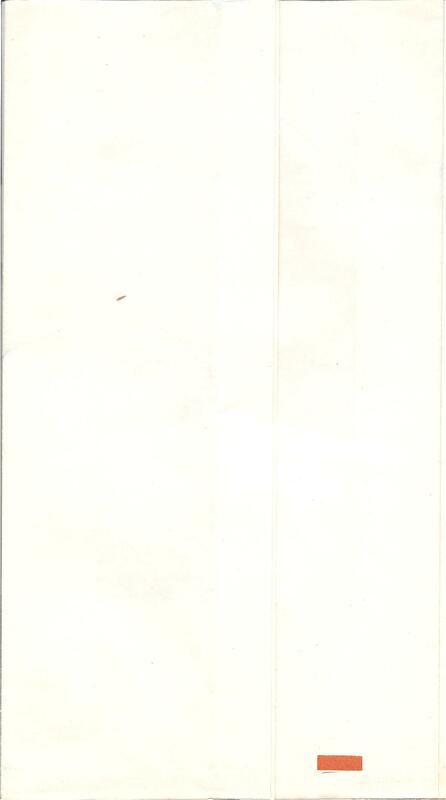 Identical to other similar AeroMexico except the tear strip is tan, not white. While you probably want to read a description of the bag, I just want to say that Donna is one of the most interesting people I know. We met at a picnic in 1978 and I have been living vicariously through her ever since. The logo on this looks like a coal mining car. Note that the 'u' in Peru is cut off for some reason. A fine Isosanplast product. 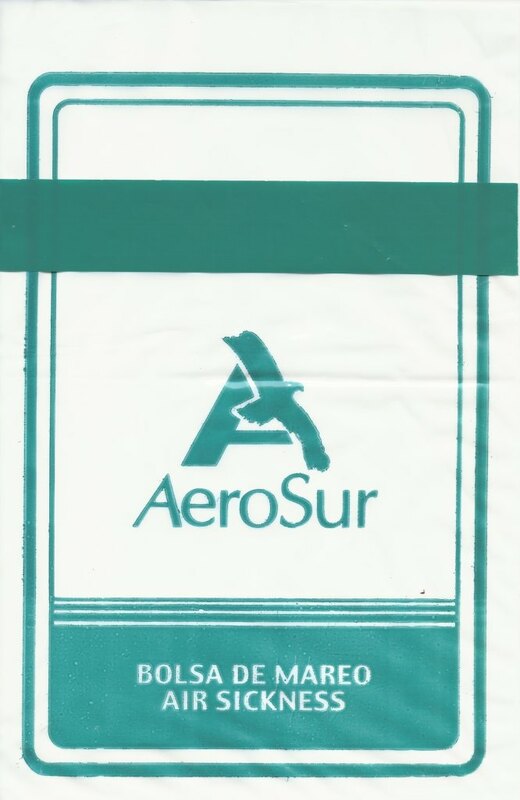 AeroSur is "La Buena Costumbre de Volar", which I think means "The good flying cucumber". Nice purple eagle logo. Cool half-eagle half-A logo. 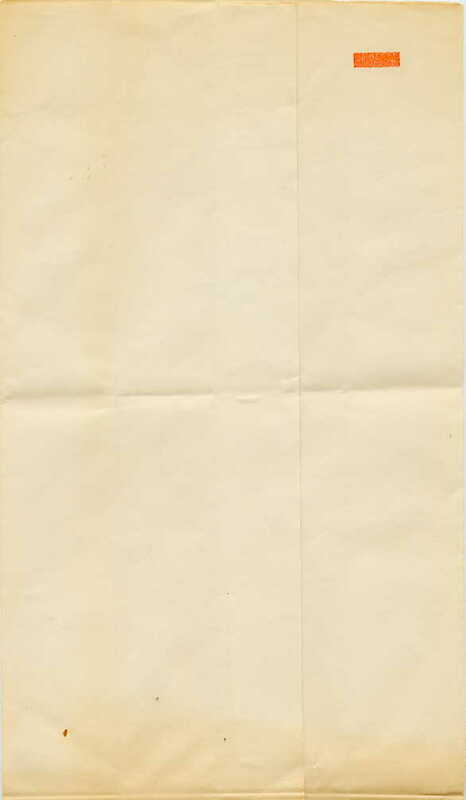 Note that the descriptive text only has the word Bolsa, but not Bag. 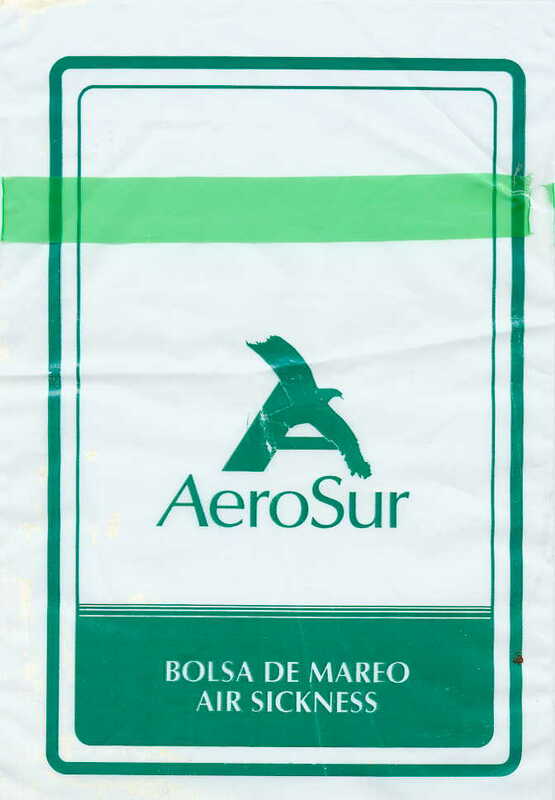 Identical to other green AeroSur bag except the eagle has now separated itself from the logo, apparently flying away. 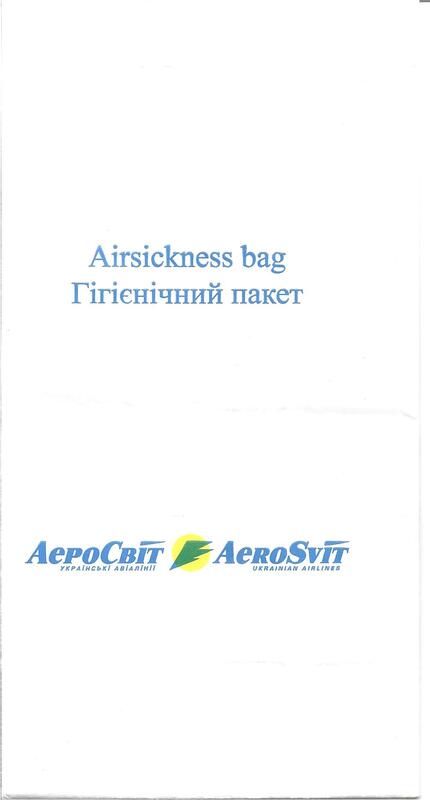 This Ukranian Airline bag looks a lot like the Ukraine International bag, demonstrating that Ukrainians aren't very original when it comes to barf bag desing. 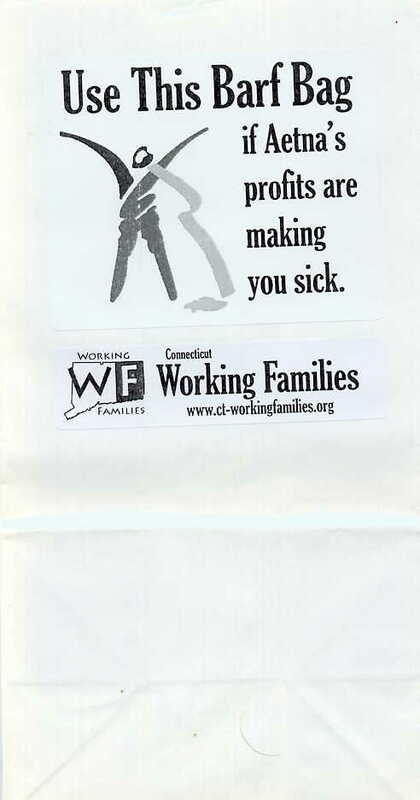 As we learn in this article, Aetna's health insurance is getting harder and harder to afford and while announcing huge profits, a fact that makes a protest group, Connecticut Working Families, sick enough to pass out this barf bag.